If you quilt, you have flotsam. Unwanted threads and materials floating about the sewing room, your clothing and eventually the entire house. 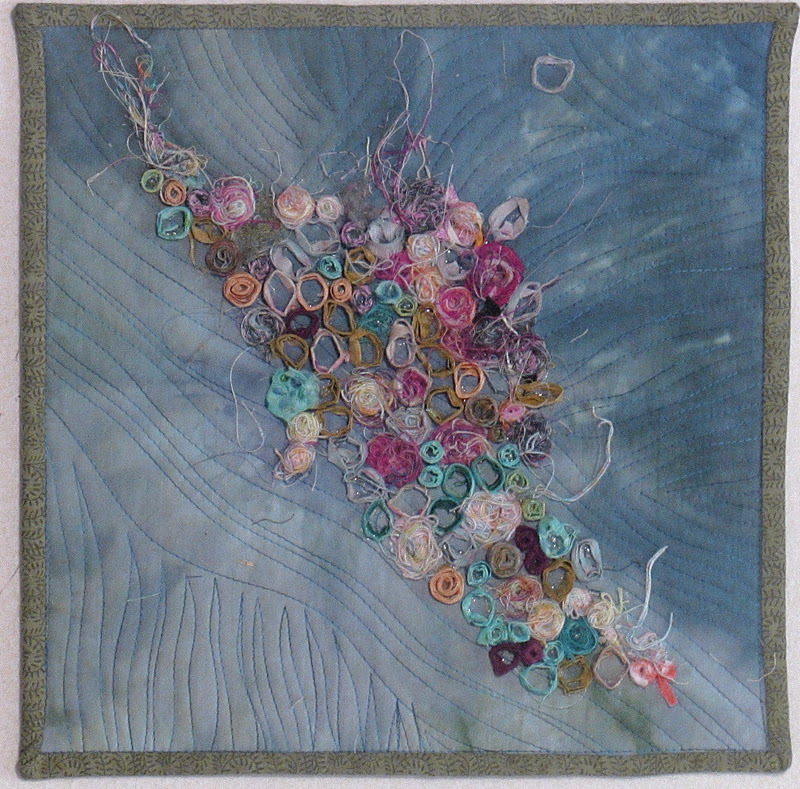 Our 12x12 challenge word was Flotsam a few months ago and I finally managed to pick up some of my quilting flotsam and arrange it on a quilted 12x12. My inspiration came from a piece I saw on Pinterest which was actually pinned from a website called The Rag and Bone Boutique. Check out the link here. This post has some beautiful pieces made from recycled materials. I think I should have went with a more neutral background and brighter colored flotsam. The good thing about this idea is that I still have a LOT of flotsam I can use to make another! I originally tried to stitch each piece of flotsam to the fabric but the machine stitching took away the dimension of the flotsam. I really can't do a lot of hand sewing right now so I ended up glueing them on with Fabric Mod Podge. As long as I don't wash the piece I think it will stay put just fine!